Well known and widely gown as Easter Cactus, this is a much easier plant to grow than it's relative Hatiora rosea and differs from it by having much larger, flatter segments and much larger flowers. Origin and Habitat: Hatiora gaertneri is endemic to Brazil, occurring in Paraná, Rio Grande do Sul and Santa Catarina. Extent of Occurrence is between 10,000 and 15,000 km2, it is known from five locations. Altitude range: It occurs from about 350 to 1,300 metres above sea level. Habitat and Ecology: It occurs as an epiphyte in Atlantic forest and appears to not be that common. There is loss of habitat due to deforestation and clearance for small-scale crop planting. Plants are probably removed from the wild, especially when in flower. 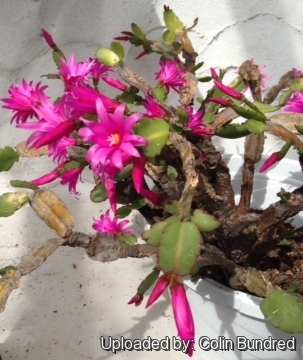 It is a very popular ornamental, and is widely grown as the Easter cactus. Epiphyllopsis gaertneri var. serrata (Linding.) Backeb. 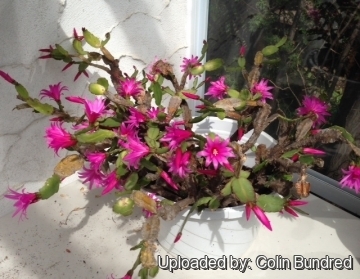 Description: The Easter Cactus Hatiora gaertneri is a much branched epiphytic, perennial cactus to 30-40 cm in diameter that features flat stems divided into segments with notched edges. The terminal segments often pendent. 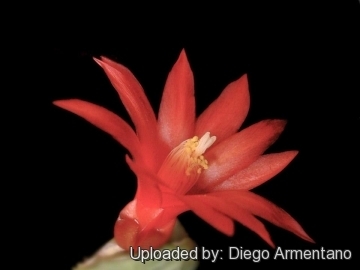 Scarlet, 4 cm long flowers appear in profusion in spring and are produced either singly or in groups. 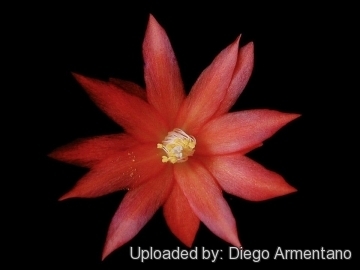 It is often offered commercially as Schlumbergera gaertneri because of its superficial resemblance to Schlumbergera × buckleyi (Christmas cactus). Stem segments: Joints usually flattened, oblong or elliptic, truncate, but sometimes 3 to 6-angled, fleshy, 4-7 cm long or more by 2 cm broad, dull green with small notches on margins subtending the areoles often purplish. Areoles: Small, with short white wool and a few brownish or yellowish bristles that sometimes appear beardlike at the tips, these deciduous. New joints and flower-buds arising from the apical areoles. Flowers: 1 to 3, usually all at distal end of the terminal branches, funnelform, actinomorphic (symmetrical), 4-5 cm long, 4-7.5 cm in diameter, dark scarlet (But available in cultivation in several colour variants). Outermost perianth-segments usually 5, short, thick, triangular, drying separately from the others. Outer perianth-segments spreading. Innermost perianth-segments more erect, nearly distinct, acute. All of the segments, except the 5 outer ones, more or less coalesce and withering, remaining on top of ovary. Pericarpel angled. Ovary crowned by a slightly depressed disk or umbilicus with upturned margin, which passes into the flower-tube, on the margin at the base of the tube are borne the free stamens. Style slender, 1.5 cm. long, red. Stigma-lobes 6, linear, cream-colored. Ovary dark red, angled, 12 mm long. Blooming season: Late winter or early spring . Fruit: Dull red, oblong, 15 mm. long, depressed at apex, in cultivation ripening Summer. Chromosome number: Hatiora gaertneri is a diploid species with a chromosome number of 2n = 2x = 22 . 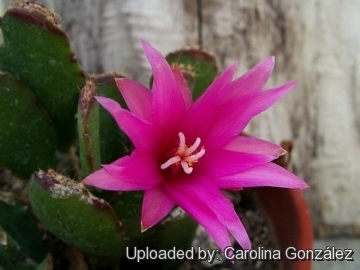 Notes: In cultivation, hybrids of Hatiora gaertneri and Hatiora rosea (Hatiora × graeseri) are among the most popular of all cactus species in cultivation. They are found world-wide in grocery stores and garden centres. 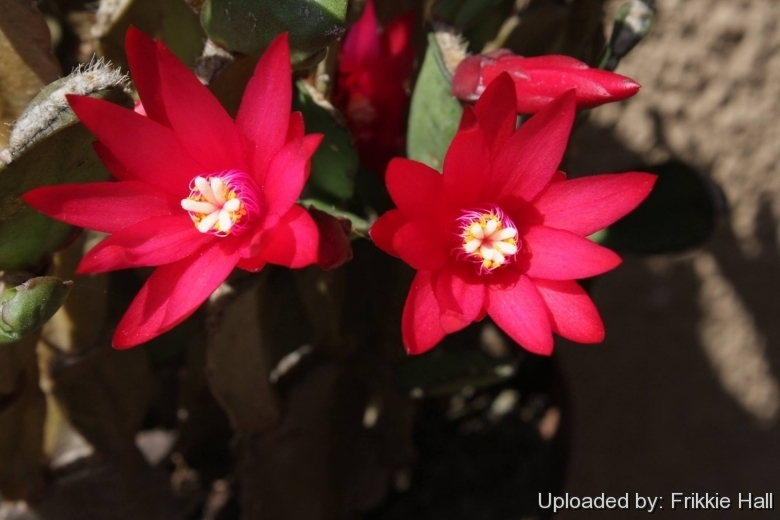 They are often sold under the common names "Spring Cactus", “Whitsun Cactus” or "Easter Cactus" and are available in several colours. 1) Taylor, N.P. & Zappi, D. 2013. Hatiora gaertneri. The IUCN Red List of Threatened Species. Version 2014.2. <www.iucnredlist.org>. Downloaded on 10 August 2014. Cultivation and Propagation: Hatiora rosea is easy to grow and tolerates neglect. This plant (as with all epiphytic cacti) prefers partial shade, and requires ample summer water (more than other cacti), but allow soil to dry slightly between waterings. Exposure: It grows best in dry, tropical or subtropical climates, it need bright, but indirect light. Shade is sometimes provided in hot climates. Extra light in the early spring will stimulate budding. Soil: It is an epiphyte cactus but is commonly grown as a foliage plant and appreciate more organic matter in potting mixes than most terrestrial cacti, and do best in soils containing sphagnum. This type of soil would normally be used for orchids, bromeliads or other epiphytic plants. Repotting: Repot it every other year in order to evaluate the health of the plant and provide a larger growing space. Waterings: They require ample summer water and partial shade, but allow soil to dry slightly between waterings. During the flowering cycle keep them moist (but not soggy). After the blossoms have fallen off you should back off on the water for a couple of months. If they need repotting, this is the time to do it. Fertilization: Feed with a high potassium fertilizer in spring during the the growing season diluted to one-fourth potency and mix into the watering can for application. Remarks: They tends to drop their buds easily if they are moved. Once flower buds have formed, DO NOT MOVE the plant, as slight changes in environment may cause the buds to drop.